If you had to pick your ultimate ladies fantasy home poker game lineup, who would get a seat? 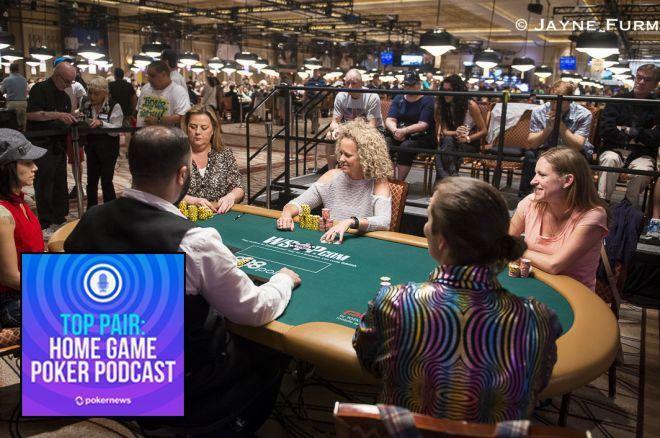 In episode 308 of the Top Pair Home Game Poker Podcast, Bruce Briggs and Robbie Strazynski discuss which women would have a seat at the table in their ultimate ladies home poker game. From poker legends to celebrities to historical figures and more, they picked quite a table! The guys also catch you up on all their own home game happenings, with Robbie feeling upstuck once more while Bruce doubles down with two sessions to report on. Plus, a huge listener mailbag with some great feedback on previous shows and, of course, a great one outer for your listening pleasure! Top Pair thanks their sponsors, J Design Cards, the Poker Notes Live mobile app, and Buy Bitcoin, for their support. Be sure to check ‘em out! Robbie: Experiencing the vicissitudes of home game poker… set over set, boat over boat, and knowing what it’s like to feel “upstuck.” Plus, big plans for the summer, heading out to Las Vegas for the World Poker Tour Tournament of Champions and Super High Roller Bowl, as well as the World Series of Poker. Bruce: Badugi, the “Rubik’s cube of poker”… back to “breakeven Bruce” mode. Plus having enough different dealer’s choice games in the mix to not repeat a single variant all night, and trying “inversion Omaha.” Finally scoring a coveted “multi-life” tournament cash. 39:41 Listener appreciation of our great interview with Scott Blumstein in episode 307. 41:09 Three different listeners – Mike Wilson, Adam from Columbus, and Captain Lou Syracuse – send in their picks for the ultimate ladies home poker game, then it’s Bruce and Robbie’s turn to name names. You can subscribe to PokerNews’ Top Pair Home Game Poker podcast on iTunes here, or you can access the RSS feed here. The PokerNews Podcast family of podcasts is now available on audioBoom. 2 Top Pair Podcast 298: Mixed Games - The Rules of... "Scrotum"
8 Top Pair Podcast 304: For a Successful Home Game, Just Stay Calm! 10 Top Pair Podcast 306: Who's At Your Ultimate Fantasy Home Poker Game?